On Saturday, while the kids were pretending to try to nap, I went for a bike ride. I started out by heading down Race Track Road. I was glad to try this stretch of road, because although it's labeled as a bike route, I can confirm it's grossly inadequate as such. I didn't feel unsafe, but I would never send a beginning bicyclist out with such a narrow shoulder and with that quantity and speed of traffic. I set out in search of Horselover Bridge, the closest geocache to our house. After ten or fifteen minutes of fruitless searching, I gave up and headed on. 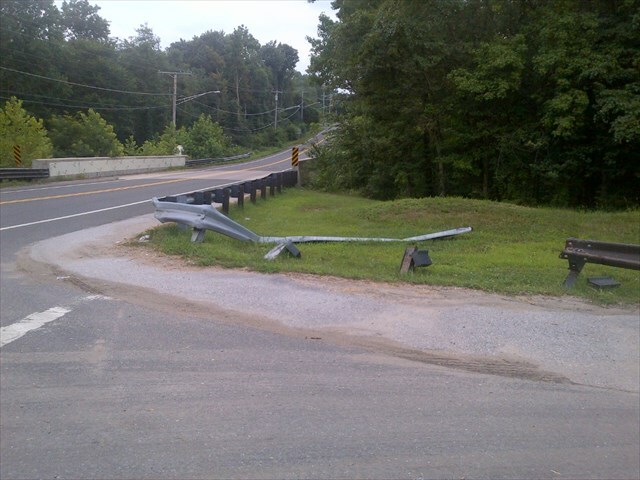 The cache is located near a guardrail that was the recent site of an automobile accident. People have found the cache since the accident, but I couldn't. The search reminded me of a lot of things that I don't like about geocaching -- standing by the side of the road, searching for a pill bottle while cars whiz by isn't my idea of fun. On the other hand, trudging through the woods and attracting ticks isn't so great either, so I don't know where that leaves me. Perhaps being picky about which caches I look for? 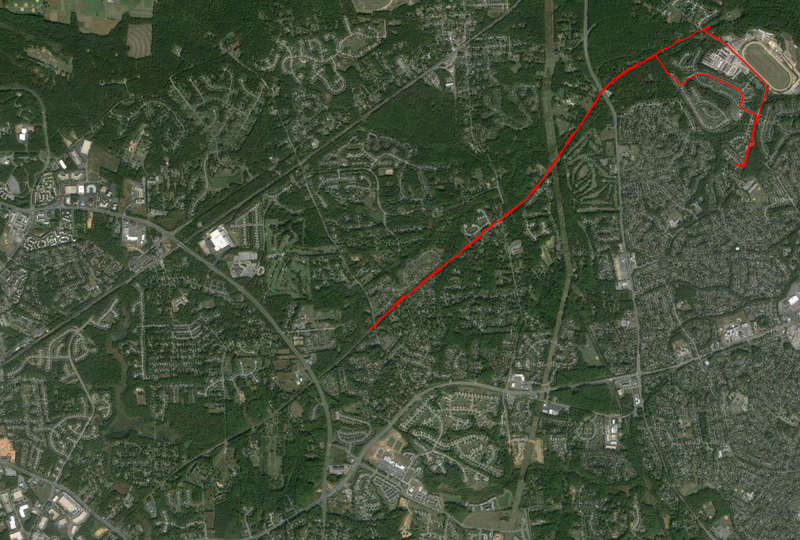 I biked on a little further to the start of the Prince George's County section of the WB&A Trail. 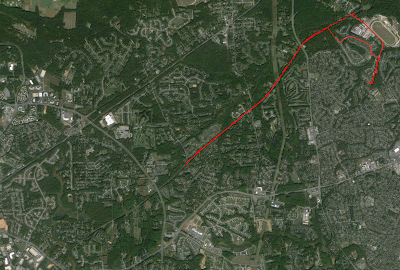 If they'd just build the dang bridge, I could have headed into Anne Arundel County here, but I only had one option. I had previously only biked (or walked) as far as the turnoff for Old Town Bowie, just over 197, so I was eager to see what lay beyond. First, some farms, and then a nice, flat ride past some suburban back yards. Every time I would envy them their easy access to the WB&A, I would look up at the power lines looming above their houses, and the feeling would pass. I turned around once I reached Hillmeade Road (just because I needed to pick a place). For future rides, I would like to take the trail a couple of miles further to its end, as well as seeing if I can find anywhere worth riding to via the trail -- perhaps via Highbridge Road. Carrabba's Italian Grill, 16431 Governor Bridge Rd. If I say "upscale Olive Garden," would you consider that a compliment? You probably should. I remarked on how Olive Garden manages to maintain good-but-not-great quality across the chain. 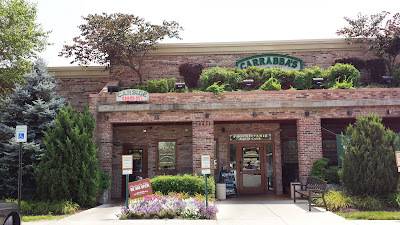 I haven't been to other Carrabba's, but my experience here is that the food is better than you'd expect at a chain. The bruschetta was excellent, and the salad and bread were also tasty. I had some very good Pasta Carrabba, but the star of the show was the Chicken Bryan that Christina ordered. It was delicious; she said she had no intention of ordering anything else there again. My return visit was takeout for a Friday lunch. I had a coupon for a free appetizer obtained by filling out a survey on our previous visit. Unfortunately the web site did not believe the restaurant was actually open for lunch, so I had to order by phone. My order was taken quickly and professionally, however. As with Ruby Tuesday, there is an option to have them come out to your car; unlike with Ruby Tuesday, that option actually works at Carrabba's. I am never sure whether or how much to tip on takeout, but since the guy actually brought my food out to the car, I did. This option could be valuable for parents of young children who don't want to unload them to pick up food. On the other hand, as a parent of young children, I am looking to feed them less expensive food that you find at Carrabba's. The salad and bread were once again very good. The free mozzarella sticks were the least appealing item I had on either visit, and the Chicken Bryan was good, but not the transcendent experience it had been the previous Saturday. I e-mailed a friend who used to live in Bowie to ask his impressions. He replied, "Much better then Olive Garden. Back when I lived in Bowie, I frequently ate their on my way home from business trips. The food was good, predictable, and the service at the bar was efficient. Easily one of my favorite restaurants in Bowie. I just wish it wasn't a chain." I agree. I've had some good Italian food at T.J. Elliott's, and I'm inclined to prefer it as a locally-owned business. But I can't say that I would always choose it over Carrabba's. So 3.5 stars to one of the best chain restaurants in Bowie. When KBQ left Fairwood last fall, their intention to move to DC meant it was no longer what I'd consider "Bowie-area". Now it looks like they're re-opening in Woodmore Towne Centre soon. That only adds a few minutes to the drive from many places in Bowie, so perhaps I'll re-visit it then. I now have 8 reviews left to complete the Bowie Restaurant Project!